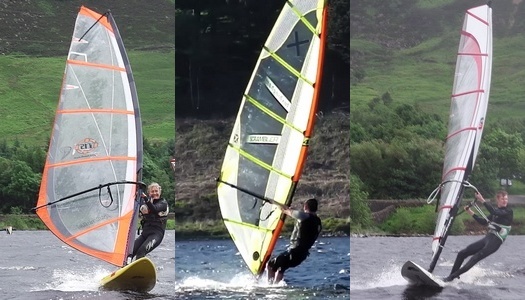 Whatever your level of windsurfing, Torside reservoir offers something for you. The prevailing winds blow along the length of the lake, leaving some more sheltered areas nearer the shores. It is a great place for progressing to short-board sailing and carving gybes. Even when the dinghies are out racing there is plenty of space to practice or try new tricks. The club is a Windsurfing Training Centre, recognised by the RYA. You can start as an absolute beginner. Once you have the confidence, you can buddy sail with other windsurfers when there is no safety boat cover. As you progress, we have a limited amount of kit which can be hired while you decide on what to buy. We can help you find the right kit and avoid the pitfalls of buying a dud. For juniors we run taster sessions for local groups and schools, courses for absolute beginners and a T15 club to progress to higher levels, racing and freestyle.